In January the Boy Scouts of America were considering lifting its ban on gay members and leaders. In April, a proposal was drafted to lift the ban on denying membership based on sexual orientation, and in May that proposal went forth and the ban was lifted. But since then many churches have either been getting on board with the new ruling by allowing Boy Scout Troops who use the facilities to continue their meetings, or by banning the Boy Scouts from the church. North Druid Hills Baptist is one of the first churches here in Atlanta that I have seen explicitly announce their support of the Boy Scouts but it also isn’t surprising since the church is located in a fairly liberal community and it leases out its space for yoga classes, plays that don’t have anything to do with the Gospel–at least not explicitly–and other activities that most churches would frown upon. 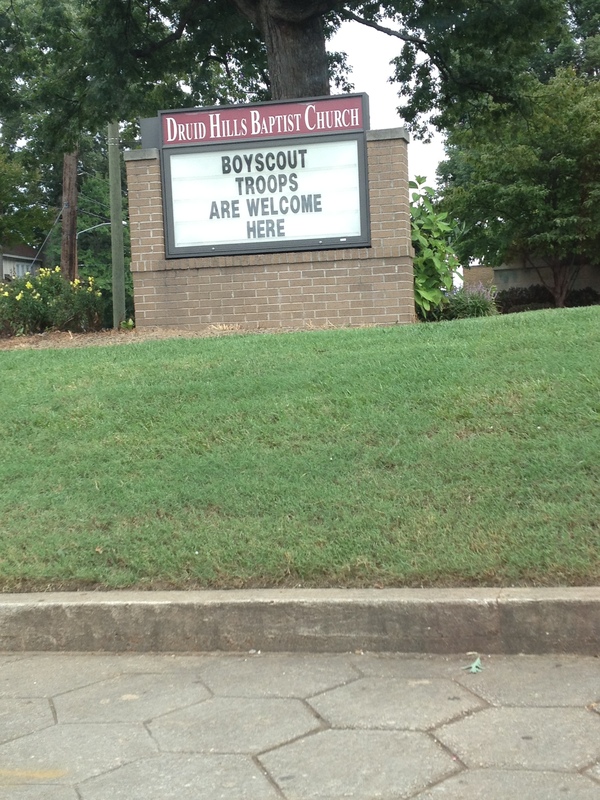 But aside from the church doing what is par for the course for them in welcoming the Boy Scouts, I was sad. I was sad not for the church but for the fact that this is even something I would be excited about. I’m more concerned in the fact that churches are closing their doors, doors that are supposed to be open to perform the most radical hospitality that can be performed in this sick world that is often too ready to shut people out because it is more interested in clinging to itself. The church, in my understanding, is not a space for exclusion but inclusion driven by love. This is something that should be a given but it isn’t. I remember sitting in a Watchnight service and hearing a pastor speak of family only as that unit which represents the biblical definition of family, man and woman. The pastor repeated this a few times and I remember tuning out of the service because all I saw was the church closing its doors. Now I understand that this is what some would consider the “biblical” perspective on this matter, but that biblical perspective often seems to leave out love. Love, which is a part of the revelation of God as shown in Jesus Christ. In shutting out those whose lifestyles don’t match up with the so-called biblical definition of family or those openly-gay boy scouts, the church compromises itself and misses the opportunity to love. This is not about tolerance which, as I have stated before, suggests a mere “putting up” with different perspectives rather than a real shift. In the church’s case it would need to be a shift toward love, outwardly expressed. Love that isn’t just spoken about but love that is actually performed. Love that isn’t just prayed about in the way that a prayer can be prayed about something like this such as, “We pray that ‘they’ discover God’s love.” But love that expresses God’s love, the love we all have access to, the love that was bestowed upon us long ago, and the love that we have responsibility to share out. Love that can be expressed through something like say, opening or keeping your doors open to the Boy Scouts. It’s a “Don’t (just) speak about it, be about it” kind of love. Otherwise, the church is no different from the world if it closes its doors on the Boy Scouts, or members of the LGBT community or other communities that would be considered marginalized. Actually, nowadays, the world is exercising a little more openness to inclusion when it comes to persons in the LGBT community so it may be the church who has to keep up. And understand me well when I say this, I know that “keeping up” may sound like you have to be on board with it all, but what I’m suggesting in “keeping up” is being sure that the world doesn’t outdo you, because the world may be able to open some doors but the church and the people within in it, those supposed people of God are (supposed to be) part of the few and the proud that show forth God’s love, and only that kind of love is credible.